Agree or Disagree: Calgary is an easy place to date. The above link is from clover.co. It has dome some research on easy it is to date in different cities. I would like to point you what they say about Canada. Then, there is this map below…. 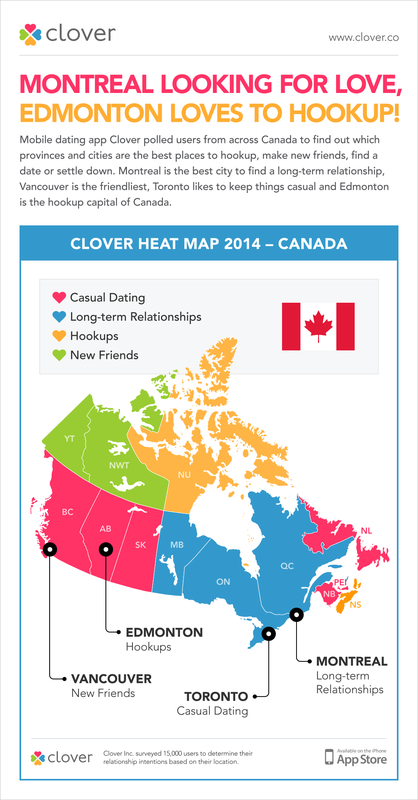 According to this research, Montreal is looking for love and Edmonton looks to hook up. So Calgarians, you live here. You might be single, or in a relationship or even yes, married. How easy is it to date in Calgary? If you are single, what are your options? Where do you go? If you are in a committed relationship, or married how easy was it for you? Are you glad to be out of the so called “scene”?